DEL MAR — Del Mar’s plans to add paid parking spaces and increase rates was put on hold when the California Coastal Commission, at the July 13 meeting, delayed its decision for 90 days so its staff can work with city officials to create mitigation for the request. Del Mar is seeking to charge $3 per hour from May through September, on holidays and during special events and the fall thoroughbred horseracing season. The hourly cost would be $2 the rest of the year, with a maximum daily, year-round fee of $15. The rates would apply to 392 of the Del Mar’s estimated 1,100 public parking spaces that provide beach access that are currently a mix of free and paid stalls, some previously authorized by the commission. Others are now operating without a coastal development permit. Of the 392 on-street spaces affected by the proposal, 243 are existing and 149 are new ones recently created by a streetscape improvement project along Via de la Valle and Camino del Mar. Of the 243 existing spaces, 58 are free spaces with no time limit and 10 have an authorized $3-per-hour flat fee and four-hour time limit. The remaining 175 are spaces with an expired or unauthorized fee and/or time limit. Paid parking would be enforced daily between 5 a.m. and 11 p.m., with no overnight parking allowed. 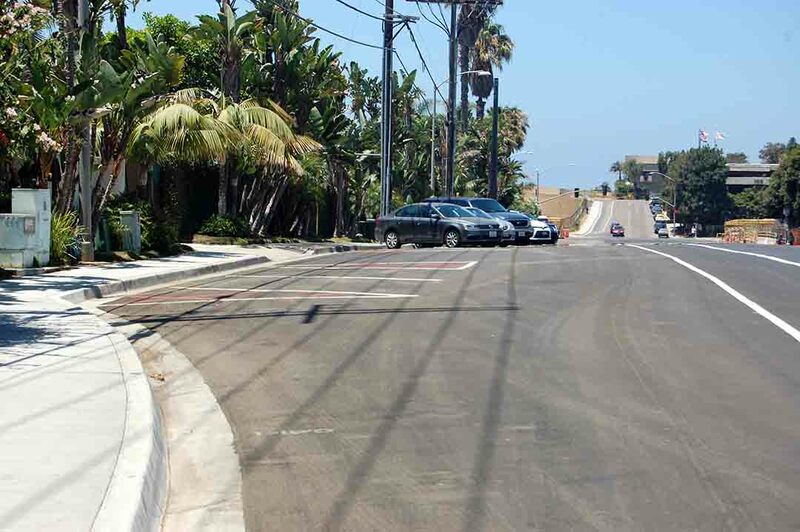 Earlier this month Del Mar City Council members approved funding to purchase six additional pay stations that would be installed on Camino del Mar and Via de la Valle for the new spaces on those two roadways. In addition to encouraging turnover and increasing the availability of parking spaces to beach visitors, the goal of the additional paid parking program is to generate revenue to help the city recover its costs to provide lifeguard services, parking enforcement, beach maintenance and other amenities associated with safe public access to the beach. Parking revenue currently goes into the city’s general fund, which pays for those services. Rick Casswell, the city’s associate planner, said Del Mar allocates about $2.2 million annually for beach safety and maintenance operations. According to the Coastal Commission staff report, the primary Coastal Act issue raised by the project is the potential impacts paid parking has on public access and recreation. “High fees limit the ability of the public to use and access the shoreline, and when fees are not comparable to those charged at similar facilities, usage patterns tend to shift to the lower cost areas, putting an additional burden on those areas,” the staff report states. In nearby cities such as Solana Beach, Encinitas and Carlsbad beach parking in similar areas is free. Casswell said as the county’s smallest city Del Mar doesn’t have a significant number of retail businesses to generate enough sales tax to pay for the services provided to the more than 2 million beach visitors annually. Only two speakers addressed the commission. One was a Solana Beach resident who opposed the proposal. The other was a representative from Surfrider Foundation who was more concerned about the increase setting a statewide precedent. Commissioner Mary Shallenberger said she objected to using so much of the “valuable coastal land” for parked cars. “I would have less of an objection to this less if some of the money were going into some kind of future trolley or transit … which allowed people to park outside the coastal zone and be transported in. “We’re closing the opportunity to do something like that by … just continuing to raise the cost of parking a car on our valuable coastal land,” she added. “If we’re going to have a discussion about raising fees and generating additional revenue off of people that are coming to visit the coast then I would like to see that those revenues that are generated are brought right back into providing amenities for those visitors,” Commissioner Mark Vargas said. He said the money could be used to pay for a variety of visitor-serving amenities such as park benches or beach showers. Erik Howell had concerns about no overnight parking. Greg Cox, who represents San Diego, said he had mixed feelings. “On the one hand having a fee, to me, doesn’t necessarily seem inappropriate, particularly depending on the types of services that are being provided,” he said. “Some beaches have lifeguard services. Some don’t. He said there should be some means for cost recovery. Casswell said Del Mar “is very happy” to continue working with Coastal Commission staff for another 90 days to “iron out” details of the proposal.